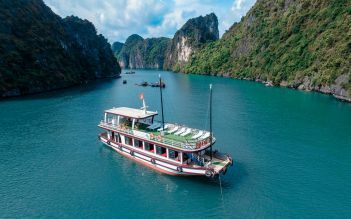 This tour focuses on Vietnamese cuisine like street food culture in Hanoi with many famous specialties, besides, tourists can have some rest in Halong bay on an overnight cruise.Try to eat like a local while you are in Hanoi and you will not be disappointed! 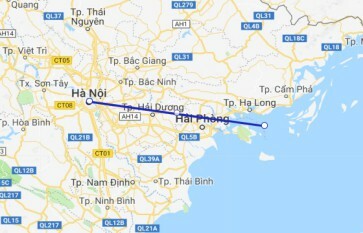 Upon arrival at Noi Bai Airport, our driver will pick you up and transfer to Hanoi center. Check in hotel and free time. 18.00 Enjoy a welcome dinner with one of the most famous restaurant in Hanoi - Cha Ca La Vong (La Vong grilled fish). Free time to visit the Old quarter by night on foot after dinner or taxi back to your hotel for overnight at hotel. After breakfast, meet with your volunteer tour guide and start a walking tour to visit French Quarters and Old Quarters with the best of them. Highlights of this trips is the French style villas and buildings in French Quaters, Sword Lake, Ngoc Son Temple and Hanoi Old Quarter with small and narrow streets but always busy and crowded from morning to night. Try to eat just like a local in a small vendor shops with your volunteer guide (many dishes available for your reference). Overnight at your hotel in Hanoi. 09.00 Tour guide will pick you up at the hotel and start a walking tour (or motorbike tour) to enjoy the street foods of Hanoi. You will have chance to taste many different specialties of Hanoi people such as BBQ bread, grilled meat on stick, fried fermented pork roll, spring rolls, Pillow cake, mixed fruits... Local lunch highlighted with the famous dish - Bun Cha Hang Manh. After that, relaxing at a cafe shop famous for “café egg” with the view to Hoan Kiem lake. Walking back to your hotel on foot or taxi and free time until picking up to the airport for departure flight. End of tour. We took the food tour as a group, we were 7 in total. We tasted 7 different dishes (soup, mini panini, salad, noodles, rice pancakes, nem, and finally sweet rice with coconut ice cream), all very good. Our guide, was very dynamic and eager to share her knowledge of Vietnamese culinary culture (and Vietnam in general). Congratulations and thank you! Mango food tour Great utensil instruction, awesome food & good food stories. Highly recommend! Coconut ice divine, bhanh cuon so delicate, egg coffee was rich and yummy. Our street food tour was arranged by our agency and we had a guide who did only such tours because he has a day job as an MD! He took us to four cafes in the Old Quarter and each one was fantastic. This is the only way for tourists to go in terms of street food because of the risk of less-than-sanitary conditions. And if you're tall and overweight like I am, be prepared for the short stools you'll be sitting on. Also if you are chopstick-challenged, no worries. They all have forks available.